Space is not empty, nor is it silent. While technically a vacuum, space nonetheless contains energetic charged particles, governed by magnetic and electric fields, and it behaves unlike anything we experience on Earth. 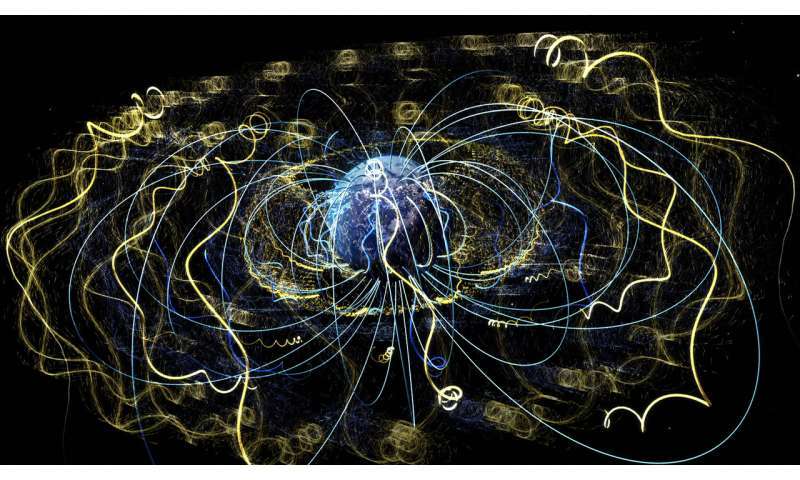 In regions laced with magnetic fields, such as the space environment surrounding our planet, particles are continually tossed to and fro by the motion of various electromagnetic waves known as plasma waves. These plasma waves, like the roaring ocean surf, create a rhythmic cacophony that—with the right tools—we can hear across space. When lighting strikes the ground, the electrical discharge can also trigger whistler-mode plasma waves. Some of the waves escape beyond the atmosphere to bounce like bumper cars along Earth's magnetic field lines between the north and south poles. Since the lightning creates a range of frequencies, and since higher frequencies travel faster, the wave howls a falling pitch, giving the wave its name—a whistler. Out beyond the plasmasphere, where the plasma is tenuous and relatively warm, whistler-mode waves create primarily rising chirps, like a flock of noisy birds. This type of wave is called chorus and is created when electrons are pushed towards the night side of Earth—which in some cases, may be caused by magnetic reconnection, a dynamic explosion of tangled magnetic field lines on the dark side of Earth. When these low energy electrons hit the plasma, they interact with particles in the plasma, imparting their energy and creating a unique rising tone. Whistler-mode waves traveling inside the plasmasphere are called plasmaspheric hiss and sound a lot like radio station static. Some scientists think hiss is also caused by lightning strikes, but others think it could be caused by chorus waves that have leaked inside the plasmasphere. 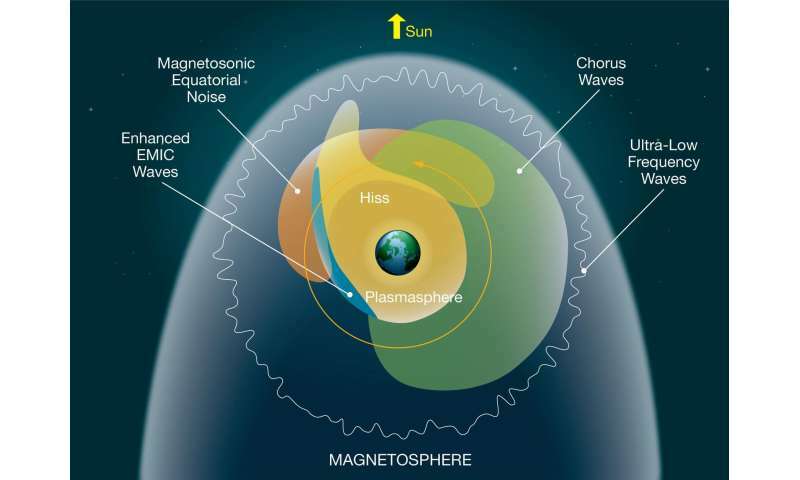 Both chorus and hiss waves are key shapers of the near-Earth environment including the Van Allen radiation belts, doughnut-shaped rings of high-energy particles encircling the planet. NASA scientists, with the help of the Van Allen Probes mission, are working to understand the dynamics of plasma waves to improve predictions of space weather, which can have damaging effects on satellites and telecommunications signals. As a part of their observations, the scientists have recorded these eerie sounds made by different plasma waves in the particle symphony surrounding Earth. NASA's two Van Allen Probe spacecraft use an instrument called EMFISIS, short for Electric and Magnetic Field Instrument Suite and Integrated Science, to measure electric and magnetic waves as they circle Earth. As the spacecraft encounter a wave, sensors record the changes in the frequency of the electric and magnetic fields. The scientists shift the frequencies to the audible range so that we can listen to the sounds of space. By understanding how waves and particles interact, scientists can learn how electrons are accelerated and lost from the radiation belts and help protect our satellites and telecommunications in space. You are only looking upon the wrinkles in field and the motion of field centers. All of space, at each point, is the summation of the fields of every charge in the universe, i.e. the field due to each charge or each charge as its field! I would learn to surf, or ski, or control a charge distribution such that it accelerates through this sea. We got more to do just listening to the silence! Note: Charge is its center and its field, at the center is only the field. When a charge oscillates, its field wrinkles as per Maxwell. The relative speed of these wrinkles, or the speed of light is the original wavelength divided by the measured period. Empty space cannot exist. Charge, apparently never created or destroyed, its field, or the charge, extends from its center to infinity. have you tried asking why? who should we consider the more reputable in this case? Listening is one thing, frequency down shifting creates very interesting audio. It gives one an audible field for the waves, i.e. the audible time varying frequency and amplitude, it's almost as if on can field actions of the sea within the space-time about the planet. Hyper, are you sure you're not a chat-bot? i thought you were a researcher seeking to find truth and expose the problems of modern science? does the logic of the point sting as it penetrates your delusion? i mean, you keep alluding to the failure of the modern scientists so... where is the correction published from the eu cult of pseudoscience idiots? where is the study that explains it all with experiments and validation? Before I give an answer, answer this, "Is their intelligent life on planet earth?" Better stated, "Is the idea of an intelligent humanity whimsical!?" Is their intelligent life on planet earth?" Better stated, "Is the idea of an intelligent humanity whimsical!?"